...and easy to read design graphs! Look at a car and you’ll see factory rubber mounts everywhere. 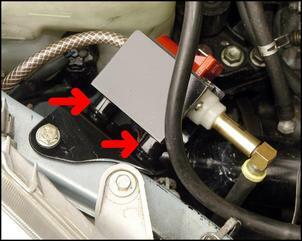 They’re on the fuel pump, used to support the radiator, under the engine and gearbox, and in some cars locating items like the ignition coil and even the power steering fluid reservoir. In aftermarket applications, rubber mounts are used to quieten noisy pumps for fuel, water injection or intercooler water sprays. And, if you need to mount anything on the engine, you’ll always use a rubber mount to soften the vibration. 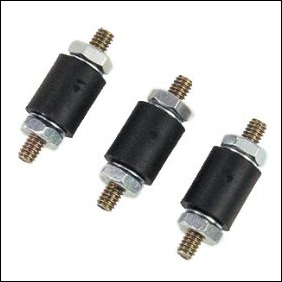 But did you know that if you pick the wrong rubber mount, you can increase the transmitted vibration, not reduce it? In fact, the wrong mount can double the vibration that gets through, making the situation far worse than having no mount at all! So how do you pick the best mount for the application – and then how do you orientate the mount for best results? It’s a lot easier than you’d first think. 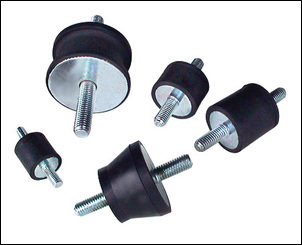 Just as is the case with springs in suspension systems, the combination of an item and its rubber mount has a natural frequency. So what is that then? Let’s start with the car suspension spring. Imagine the coil spring out of the car sitting vertically on the ground. You place a weight on it and then you carefully push the weight downwards and release it. The weight will bounce up and down at the spring’s natural frequency. Over time the bounces will die away (they’ll get smaller) but they’ll continue to occur at a certain number of cycles per second, or Hertz (Hz), until the spring is still. Let’s say that the natural frequency of the spring/mass combination is 2Hz – that is, it’s bouncing up and down twice per second. If you then push down on the spring at the same frequency (ie twice per second), the movement of the mass will get greater and greater – like when you push on a child’s swing at just the right times. So in this example, the natural frequency is 2Hz and the forcing frequency (your added push) is also 2Hz – and so the movement of the mass up and down on the spring gets increasingly larger. Let’s stick with the same bouncing spring and mass, so retaining the natural frequency of 2Hz. But this time, let’s push down on the spring at 10 times a second. Because the forcing frequency (10Hz) is so different to the natural frequency (2Hz), there’s barely any extra movement of the mass up and down. That is, completely unlike the above example, the mass doesn’t move further and further in its bouncing. 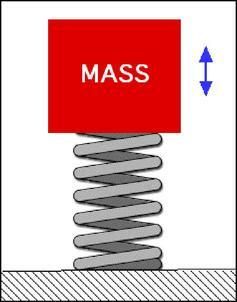 In just the same way as the mass on the spring, a device mounted on a rubber mount also has a natural frequency – it will bounce on its mounts. So what about the forcing frequency? A pulsing intercooler water spray pump might have a frequency of vibration of 50Hz – it’s vibrating up and down 50 times per second. If the natural frequency of the rubber mount and pump is also 50hz, the forcing frequency (the pump vibration) and the natural frequency (the combination of the weight and rubber mount) will be the same. In that case, not only will all the pump vibration get through to the bodywork, but in fact the vibration will be amplified! So as you can see, the relationship between the natural frequency of the system and the forcing frequency is vital if the right decisions about rubber mounts are to be made. That all sounds fine in theory, but what does it mean in the workshop? The first aspect to consider is the forcing frequency – the frequency of whatever is creating the vibration. In many cases, you can simply feel or listen to the frequency to get a rough idea of what it is. Anything below 30Hz you can feel as a vibration; from 30 – 50Hz it’s a very deep sound (as deep as you can possibly hear), and from 50 – 100Hz it’s a low bass note. Holding the vibrating object directly against the bodywork, or placing a stethoscope against the vibrating object, can be used to magnify the sound. Now, how do you find out what the natural frequency is of the device on its rubber mounts? This is really easy – this frequency just depends on how much the object sags on its mounts, what is called its static deflection. The natural frequency of the system can be found out by measuring the static deflection in inches, then square rooting it on a calculator. The number 188 is then divided by this figure. Let’s say we have a pump mounted on rubber mounts. When the system is correctly orientated, the pump deflects (droops) on its mounts by 0.5 inches. The square root of 0.5 = 0.707, and 188 divided by 0.707 = 266. This is the natural frequency in vibrations per minute; divide by 60 to get Hz = 4.4Hz. So in this case the natural frequency is 4.4Hz. A static deflection of 0.5 inches is a lot – but what if it’s only 0.04 inches (1mm)? Then the natural frequency calculates out to 16Hz. So, how much does it matter if the natural frequency is close to the forcing frequency? In the first example, the ratio of forcing frequency to natural frequency was 50 divided by 4.4 = 11. In the second example the ratio of forcing frequency to natural frequency was 50 divided by 16 = 3. To get best vibration reduction, the ratio of forcing frequency to natural frequency has to be 3 or greater. 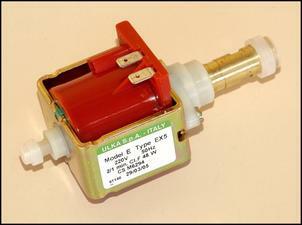 So in the case of the fuel pump, rubber mounts that let the pump statically deflect by only 1mm would be fine. But what about if you’re mounting a complete engine? If we assume a forcing frequency of 17Hz and a static deflection in the mounts of again 0.04 inches (1mm), giving a natural frequency of 16Hz, the ratio of forcing frequency to natural frequency becomes 17 divided by 16, or 1.1. That’s nowhere near a ratio of 3, is it? In this case, with engine mounts that deflect by only 1mm, the result would be terrible. But how come the engine mount wouldn’t work and yet the pump mount would work, when both have the same deflection of 1mm? If you said ‘because the engine is heavier’ you’re wrong. It’s because the forcing frequency is so different – 50Hz in the case of the pump and 17Hz in the case of the engine. If all that is starting to sound a bit complex, here are some easy to read graphs. 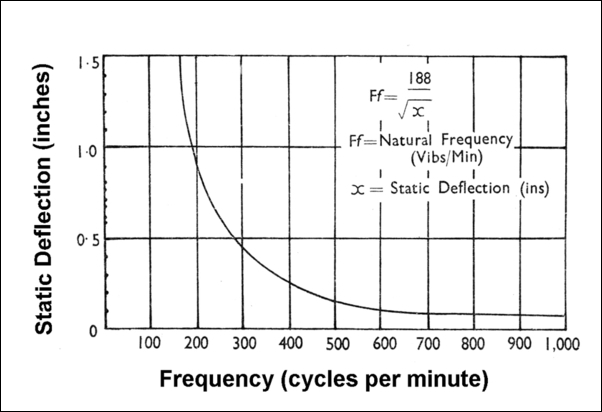 This one shows the relationship between static deflection (in inches) and frequency. Note that the frequency is expressed in cycles per minute: divide by 60 to get cycles per second (Hz). So let’s say that the static deflection is ¾ inch – the natural frequency is then about 180 cycles per minute, or 3Hz. You can also see from the graph that as the deflections get very small, the natural frequency really races upwards in value. 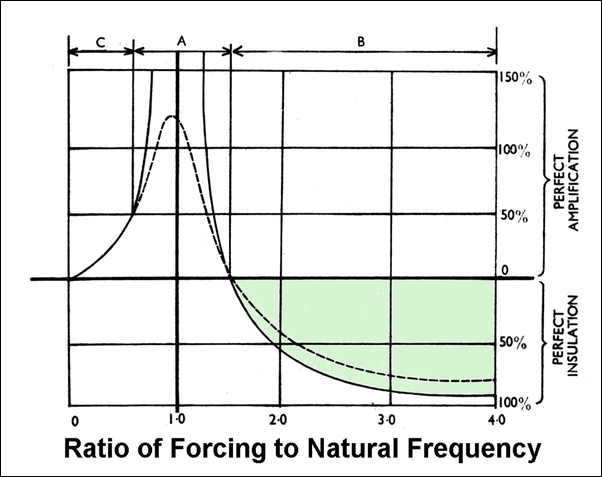 The ratio of forcing frequency to natural frequency, and the affect it has on vibration transmission, can be seen here. With a ratio of 1, the vibration is actually amplified by well over 100 per cent; with a ratio of 3 or greater it is reduced by around 90 per cent. You want to design so that the ratio is in the area of green! Rubber mounts are available in a huge variety of shapes, sizes and designs. So how do you pick the correct mount for the application? - Obviously, the mount must also be strong enough for its loading. 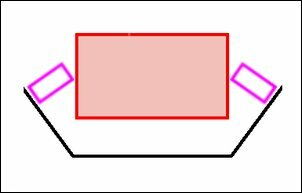 The amount of static deflection that is achieved with a given mount can be altered by changing its mounting orientation. Here two rubber mounts are located so that they are in compression (the weight of the red object is pushing down on them). 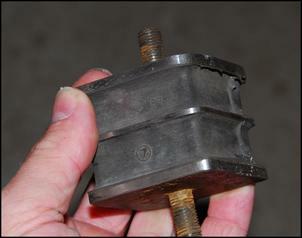 Here the orientation of the mounts has been altered so that they are in shear as well as compression. In most cases, the mounts will deflect further, so increasing the resistance against transmitting vertical vibrations. 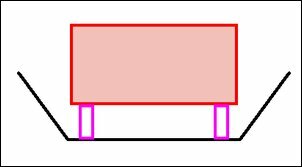 The degree of static deflection of a load supported by a mount of this type can be adjusted over a wide range by altering the orientation of the mount. The difference between a rubber mount that decreases transmitted vibration by 90 per cent – or one that increases vibration by well over 100 per cent – can be a very simple design change. Don’t overlook this vital area!